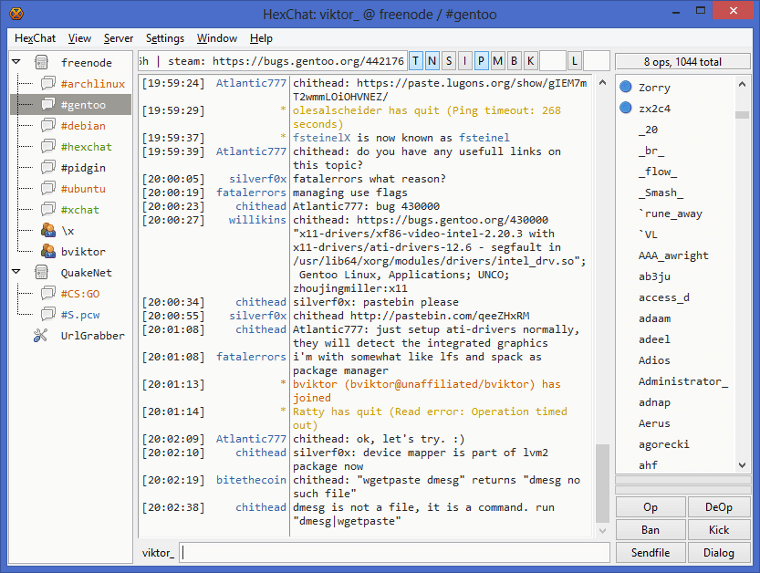 K-Visual-IRC (KVIrc) is a customizable Internet Relay Chat client allowing multiple server connections, notify and ignore lists, mIRC font codes, themes, and more. The program supports standard + extended direct connect connections (with resume), IPv6, SOCKv4, SOCKSv5, and HTTP proxies. It also comes with a sophisticated scripting language that allows you to implement automated reactions to network events. The program is cross-platform with clients available for Mac, BSD, and Linux. KVIrc Portable is a portable wrapper for KVIrc. Alternatively, you can make standard KVIrc portable by following these instructions. How to extract: Download the portable installer and install to a folder of your choice. Launch KVIrcPortable.exe. In latest version the folder is called $ and not $_OUTDIR other than that the instructions are the same. 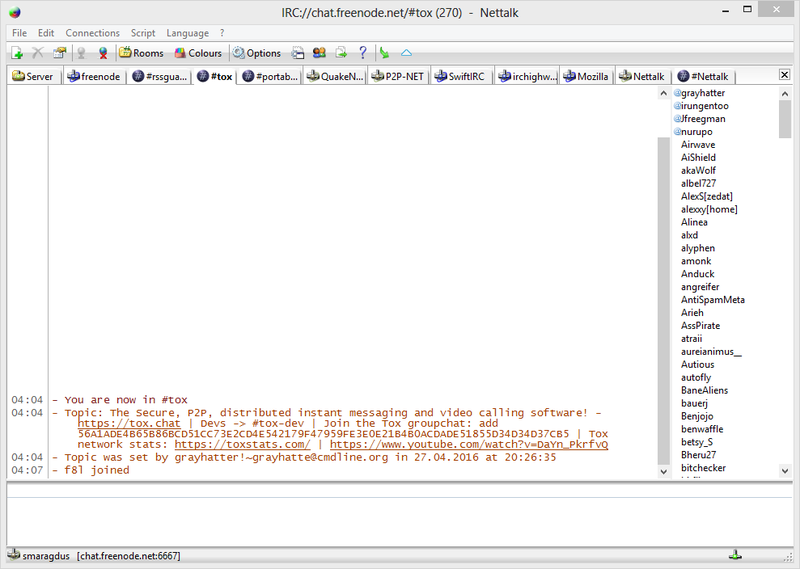 PChat is an IRC client forked from XChat with a customizable, tabbed or tree interface, SSL support, DCC transfers and chats, CTCP, and multiple normal or SSL servers. 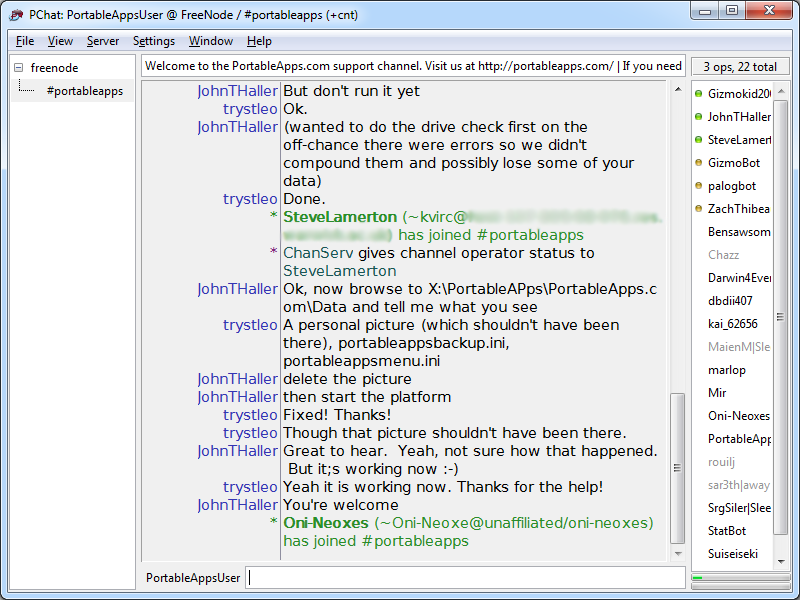 PChat Portable is the portable version released by the developer. Includes a variety of scripting add-ons via the website including Lua, Perl, Python, and TCL. Also available for Linux. Unicode support: Partial. PChat supports Unicode within the app itself but it can not be installed to a path containing certain Unicode characters. How to extract: Download the self-extracting EXE and extract to a folder of your choice. Launch PChatPortable.exe. Crashes a lot, and pieces of windows get "left behind" over the interface, like the chat text and then slowly scrolls out of view. Very bad. This is 37mb for two reasons: a) it is a GTK app and includes the full GTK runtimes in the package, and B) it contains full localization for dozens of languages. Removing the localizations and UPXing the GTK runtimes should bring this down to a fraction of its size.